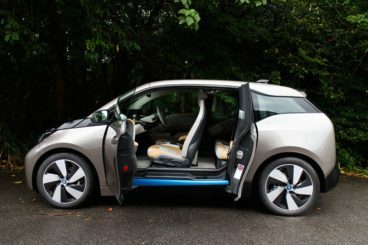 Looking for an objective review of the BMW i3 Hatchback? OSV has got you covered, from performance to lease deals. The new BMW i3 Hatchback is a car for the 21st century. Planet-friendly and looking every inch like it’s arrived from a distant galaxy, it’s a sprightly electric city car that’s perfect for anyone who wants to get out and about in the city in something different. It’s cheap to run, looks like it’s from the future, and is arguably the most fun you can have in a BMW without mortgaging your house first. 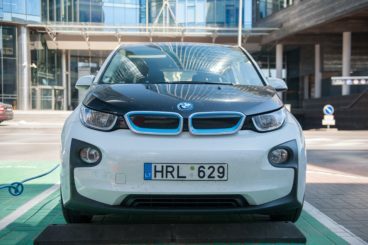 The new i3 represents a further foray on BMW’s part into the world of electric cars. Both the petrol-electric hybrid and the pure electric i3 are excellent choices for anyone who wants to do their bit for the environment. And thanks to the introduction of a brand new 94Ah high-capacity battery pack, range is no longer the stumbling block for customers it once was. OSV takes a look at what the car is all about with our 2017 BMW i3 Hatchback review. The i3 looks more like a space shuttle than a car. If you remember the kids TV series The Jetsons, this car probably wouldn’t have looked out of place there. However, despite looking a bit alien on suburban roads, the i3 drives as competently as you’d expect a BMW to drive. Even better, it’s just as fun as any other compact city car you’ve driven before. Thanks to a raised driving position and a tight turning circle, this pint-sized BMW can negotiate city streets with ease. It can dart in and out of gaps without any hassle, with our only concern being that that the suspension is a tad rocky. Unlike a bigger BMW (which is pretty much all the other BMW’s), the i3 gets skinny tyres. These might work well most of the time in the right conditions, but they lack grip. However, it’s a minor criticism. The cars regenerative system, moreover, offsets concerns that you might lose control. It’s a system that might seem unusual at first, but you’ll soon get up to speed. The fully electric i3 has plenty of performance on offer, and can do the 0-62 dash in just 7.3 seconds. To put that into perspective, that’s over 3.0 seconds quicker than the Toyota Prius. Wow. But that’s not even the best part; the best part is that it feels even quicker than those numbers. It’s also really satisfying that the engine doesn’t make any noise, and delvers all its power straight away at any speed. The petrol engine is more of a generator than a conventional engine. It’s a 0.65-litre unit that powers the front wheels only, leaving the batteries to power the rear ones. It can do 0-62mph in a respectable 8.1 seconds. The reason it’s almost a full second slower than the pure electric model is plain and simple – it weighs more. Still, power is available at a click of the fingers, and it puts most other city cars to shame. The engine will cut to charge the batteries from time to time, but it won’t alter the way the hatchback feels. It emits a soft hum that’s certainly not unpleasant to the ears. The i3 makes good on its space-age looks inside, where its interior is more futuristic than most other electric cars on sale today. It’s also comfortable most of the time, though poorer road surfaces will expose its overly firm suspension setup. It’s a strange-looking car that won’t appeal to all tastes. Looked at from a purely practical point of view, its tall body shape makes no sense, as it makes the car vulnerable to crosswinds. Conventional dials are out, and hi-tech screens on the dash are in. A big digital display sits in the middle of the dash, and helps to make the car usable. 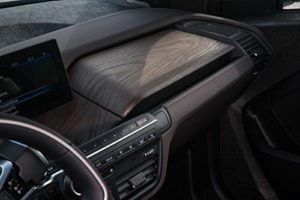 To compliment the cars concerns for our environment, BWM offers you the chance to add renewable materials like eucalyptus wood to the cabin. As well as being planet-friendly, these materials are also exotic and help to give the interior a unique flavour. Make no mistake, this is a small car. But that doesn’t seem to matter too much, because BMW have managed to extract a lot of space out of its dimensions. So much so that we’re wondering whether it really has come from outer space! Excellent packaging and some clever design work mean the i3 is one of the comfiest and practical small cars around right now. The two people upfront get plenty of room, while anyone in the back shouldn’t be too uncomfortable. This is strictly a four-seater, though, so any fifth passenger would have to miss out. The large windows are a bonus, and contribute to the cabin having a light, airy feel to it. The boot is the only disappointment. Measuring just 260-litres, it’s not going to be much use if you regularly carry fairly big loads. BMW couldn’t produce a futuristic car and then not stock it up with the latest cutting edge technology. Thankfully, they haven’t. The i3 gets treated to the brand’s excellent and intuitive iDrive system, Bluetooth connectivity, a DAB digital radio, and rear parking sensors. All models also get 19” alloys, and you can specify a Protonic Blue paint hue if you wish. Doing so further heightens the cars space-age looks. All models get sat nav as standard, too, and it’s a particularly neat sat nav – it lets you know where you can travel to on just electricity before the engine kicks in or, if you’ve bought a pure electric car, you need to charge her up. This may be a car from the future, but it fell a little short during its EuroNCAP crash test, and only bagged 4 out of the available 5 stars. However, it scored well or both adult and child occupant protection. Its standard safety kit includes a seatbelt buzzer reminder, electronic stability control, and 6 airbags. Prices for the new car start out from £32,300, and rise to £35,500. For more information on our lease deals, check out our page here. In terms of running costs, the i3 is a star. The fully-electric version doesn’t cost anything in fuel costs, and even if you do go for the higher-end range extender variant, you’ll still pay little in running costs. The REx is good for a staggering 470mpg, costs nothing to tax, and is free from the London Congestion Charge. It’s the same story with the fully-electric variant, which can do almost 200 miles before it needs recharging. Whichever i3 model you go for, you’ll be doing your bit for the environment. If you want to travel in style, the i3’s unique interior is different class in this sector where drab greys generally dominate cabins. There isn’t a more desirable EV of this type on the market at the moment. Fuel economy returns of 470mpg are as otherworldly as the car looks. Cheap to run, but expensive to buy in the first place. Truth be told, you can get a number of the features found in this car for much cheaper elsewhere. It’s far from the comfiest small city car. The firm suspension could prove to be a fly in the ointment after a while. Let’s see how the car fares against two of its higher-specced rivals in the comparison section of our 2017 BMW i3 Hatchback review. The brand new Nissan Leaf is no louder than a whisper. It’s comfy, and remarkably hassle-free to drive. There is very little not to like about this veteran of the electric car sector. The Leaf has got all the essential ingredients we want from a modern-day electric car. Sure, it doesn’t crackle with excitement, but it gets the job done without any stress. It’s great for the environment and ideal for anyone who’s a bit fed up of paying too much for their fuel. The suspension setup is softer than the i3’s, which means it absorbs lumps and bumps better. However, it can’t compete with the i3’s scalpel-sharp steering. Instead, the Leaf’s steering is light, something you notice on twisting roads. It drives like a normal car, and is super easy to start up and live with. You press the start button, and you’re ready to go. Never has “doing something at the push of a button” been this easy. Like the i3’s electric motor, the one here delivers all its 108bhp straight away. Perfect for when you want to get ahead of the traffic. Where it falls short, though, is in terms of speed. Whereas the BMW can do 0-62 in just 7.3 seconds, the Leaf is left trailing with its 0-62 time of 11.5 seconds. Still, it all comes down to what you need it for. And the Lead makes perfect sense for stop-start city driving. Both cars are cheap to run, with the Leaf promising to turn you £2 into 124 miles of driving. However, this is the highest spec model we’re looking at, and it will be nigh on impossible to achieve those numbers. It costs nothing to tax, and it’s free from the London Congestion Charge, too. The battery is expensive, and a new one will set you back almost £5,000. To ease your worries here, Nissan do monthly leases on batteries. The Leaf doesn’t look quite as futuristic as the BMW inside or out, but if you prefer a bit of subtlety you’ll enjoy this one. The central display in the dash is attractive, and the car is just as well insulated from exterior noises as the i3 Hatchback. It’s moreover just as comfortable and relaxing – if not more so. Electric cars are still not the most practical around, with charging times proving awkward and dampening the experience of owning one. The Leaf’s battery takes eight hours to fully charge, which could be a source of frustration. That aside, this is a spacious, useful car. Four adults can sit in comfort quite easily, while a decent-sized glove box and armrest storage unit make up the storage spaces. The boot is much bigger than the i3’s, and measures 370-litres. 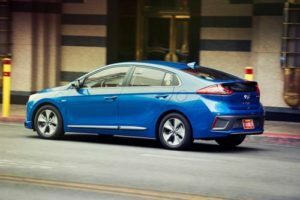 The new Hyundai Ioniq is a bit of a mouthful to pronounce, but its high-spec version is a solid rival to the BMW i3 Hatchback. You can get your hands on hybrid versions of the Ioniq, but for the purpose of this review, we’re looking only at the electric version. It’s Hyundai’s first ever fully electric offering. But has it fluffed its lines on its debut? In a word, No. 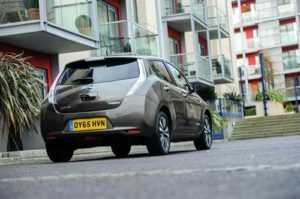 This is a seriously impressive EV family car that looks great and drives well. Its electric motor produces up to 119bhp, which is enough to get you from a standstill to 62mph in just over 10.0 seconds. That makes it three seconds slower than the i3, but the truth is that the performance on offer here will be more than enough for most buyers. Moreover, its top speed is 103mph, which means cruising along at 70mph will be super relaxing. Its feathery battery also contributes to a hassle-free driving experience, as does the aerodynamic body-work, which is the product of some expert handiwork. Both of these factors also make for an efficient car that costs just pennies to charge. This high-specced electric Ioniq doesn’t have a lot to distinguish it from the hybrid Ioniq, but one difference is its solid front grille. It gives the car an edgy look, and also improves efficiency. Inside, there is lots of space and a good amount of standard kit, but the design is uninspired. Certainly compared to the i3 it looks unimaginative. However, it’s still a pleasant place to spend your time on the road. The dash is clutter free, the dials are easy to find and use, and the greyness is broken up here and there by lashings of copper. The Ioniq has the practical edge over the BMW. It can seat five people in comfort, and its boot measures 350-litres. Like the BMW, it also houses large windows, and comes with rear folding seats. BMW did the right thing when they built this car from the ground up, as opposed to what Audi did when they converted their A3 into an EV. 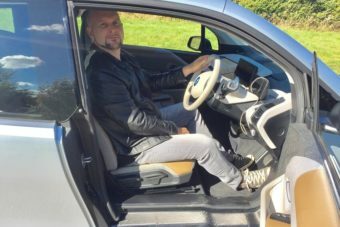 The result is very desirable electric vehicle that helps customers do their bit for the planet while enjoying life on the road in a hushed, futuristic-looking car that’s loaded with plenty of advanced tech. The only downside is the firm ride. 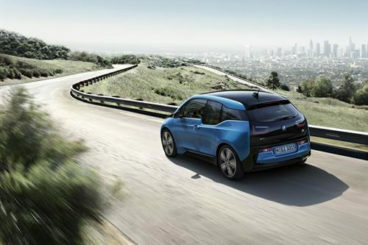 That apart, the new BMW i3 Hatchback is an engaging, spacious small city car that’s the smartest choice in this sector. Fill out the form below with your details, and one of out highly qualified specialists will be in contact within 24 hours.